What Is a Type Set? A type set, or type collection, is a coin collection based upon the coin's design or type. Instead of assembling a collection of coins based upon date and mint, a type set will consist of one coin from each design type. In many ways this is an ideal way for an intermediate coin collector to assemble a coin collection that contains a wide variety of different coins. 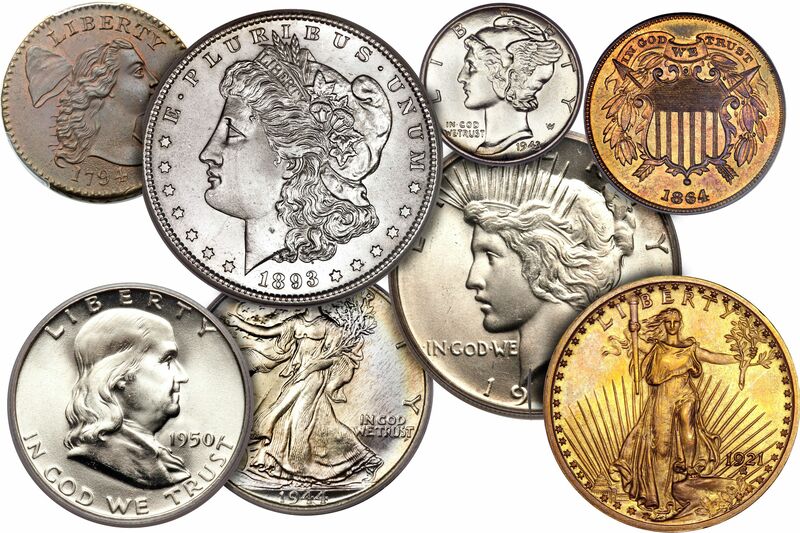 Collecting United States coins by type allows you to assemble a beautiful and varied collection of coins while remaining within your coin collecting budget. Unlike collecting coins by date and mintmark, you only need one coin from each series. Therefore, you have the ability to pick the lowest cost coin in the highest available grade that you can afford. Additionally, you can choose the type of coins you want to collect. Some coin collectors who are focused on investment may choose to collect a type set of United States gold coins. Beginner and budget minded collectors may start with assembling a type set of copper coins that begin in the 19th century. In this way, they can avoid the very high-priced coins minted from 1793 to 1799. Within each series of coins there have always been minor changes and modifications made to the design. Some numismatists only assemble their collection based upon the major design, while others will assemble their collections to include the minor design changes. These minor changes are also known as "subtypes." High quality coins always appreciate in value the fastest. So take your time and look for the highest quality coins that you can afford. Also, learn about the different type coins by acquiring books on collecting United States type coins. Doing a little research will help you learn about each type and subtype that is available so you can recognize a quality coin at a fair price. If you have never collected a type set of United States coins before, you will best be served by choosing a particular denomination and work to assemble a complete type collection of that denomination first. Concentrate on a specific series that you are familiar with and look for a high quality coins at a reasonable price that you can afford. If you are on a limited budget, you will best be served by starting with copper coins or small silver coins. Additionally, you may want to initially start with just collecting the major types before you venture into assembling a type set that includes subtypes. If you are an advanced collector and your coin collecting budget is a lot deeper, you might want to try a gold type set of the major designs for an individual denomination.